The Yakuza games have never been shy about shining a light on some of Japan's more scandalous issues. Of course, there is the problem of practically legitimized crime families running rampant throughout the country's nightlife, but it's the money and ways of obtaining it behind these issues which the series brings to the surface so well. 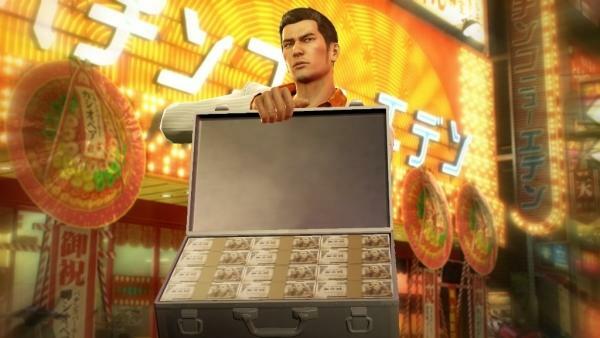 Money is everything in the new Yakuza Zero, kind of like New Super Mario Bros. 2 in that way. The mighty dollar, or yen in this case, is how a younger and cleaner cut Kazuma Kiryu expands his gameplay abilities and his influence within the yakuza syndicate. He can obtain money through shady real-estate deals, grooming hostesses, and going so far as to laying out the tables in the hostess clubs his clients will attend. Of course, he can just beat up thugs and take their cash as well. New gameplay footage features a lot of Japanese explanations, but the visuals alone should give you enough of an idea as to how these gameplay mechanics all work together to make the dangerous gangster the fear of Tokyo's streets. This game is an origin story for our anti-hero before he became a disenchanted adult, and it takes place in the 1980s, when everyone in Japan had a ton of money to squander. I'm just hoping against hope that Kazuma bumps into Shenmue's Ryo Hazuki at some point in this adventure. He should still be looking for sailors during this game's time-frame. No confirmation of a localization just yet for Yakuza Zero, but it will be released in Japan on March 12 for the PlayStation 3 and PlayStation 4. SEGA has finally confirmed Yakuza 5 for a release on the PlayStation 3 coming in 2015, so maybe Yakuza Zero will follow. It has a better chance than the samurai spin-offs.